Taking its name from Mount Etna, the imposing volcano that looms over the city, Via Etnea is one of Catania’s most important thoroughfares, lined with shops, restaurants, and cafés. A lively destination both day and night, Via Etnea connects two of the city’s top attractions—Piazza Duomo and Villa Bellini. Via Etnea runs almost 2 miles (3 kilometers) through the heart of the city, and a guided walking or Segway tour along its length is the best way to appreciate its many historical sights and monuments. From Via Etnea, many small-group tours head to other nearby city highlights such as Ursino Castle and Monastero dei Benedettini. At the southern end of Via Etnea is Piazza Duomo, a UNESCO World Heritage Site with the Fontana dell’Elefante—symbol of Catania—at its center. The square is also home to the grand Palazzo degli Elefanti, a number of baroque palaces, and the Cathedral di Sant’Agata (Duomo). Heading north up Via Etnea, you’ll pass Piazza Università and Piazza Stesicoro, which houses the ruins of a Roman amphitheater and a monument to local composer Vincenzo Bellini. From here, it’s a short walk to the busy central market in Piazza Carlo Alberto and Villa Bellini, the city’s main park. Via Etnea is a great place to rub elbows with locals, who flock here to dine, shop, and take an evening passeggiata (stroll). If you’re joining a walking tour of Catania, comfortable shoes and a sun hat are recommended. The thoroughfare is lined by sidewalks and accessible to wheelchair users. With its many cafés and restaurants, Via Etnea is where you can stop for anything from a light snack to a full meal. 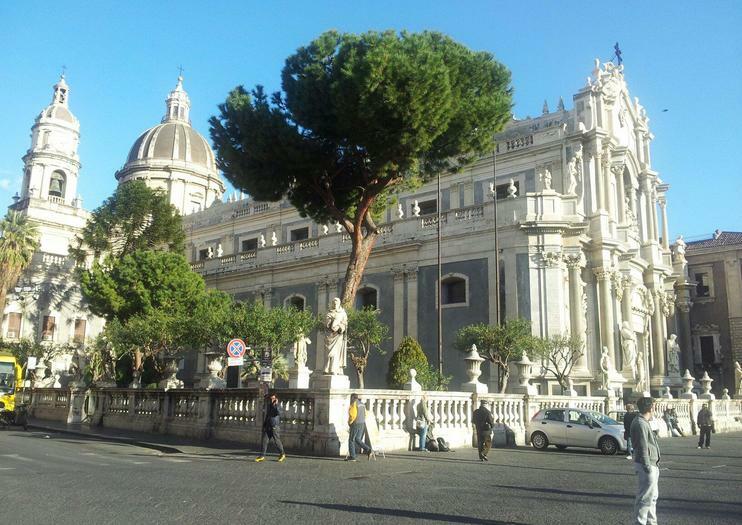 Via Etnea runs directly through the heart of Catania’s historic city center from Piazza Duomo to Villa Bellini, an easy walk from the Catania Centrale train station. Catania, like all Sicilian cities, can be uncomfortably hot in the summer months. Do as the locals do and stroll the length of Via Etnea in the cooler morning or evening hours, saving indoor sights such as Ursino Castle and the cathedral for the hottest hours of the day. A hub for shopping and socializing, Via Etnea is always bustling, but on Saturdays and around major holidays it can be very crowded. After seeing the sights and browsing the shops, you can escape the chaos at nearby Villa Bellini (also known and Giardino Bellini), Catania’s delightful public park. Relax in the shade on one of the many inviting benches and admire the 19th-century landscaping and views of Mount Etna. Catania has a world of offerings for travelers: UNESCO World Heritage sites, fascinating history, street markets, and a cuisine that is the envy of the Mediterranean. It can be a challenge to pack it all in one day, but this private half-day walking tour—which pairs the city’s top sights with traditional street food and wine—allows you to do just that. Upgrade to end the tour with a wine and food tasting at a local restaurant. Experience Sicily through the eyes of The Godfather on a private tour with stops at the movie’s iconic film locations, from the Church of Santa Lucia to Forza D’Agro. In addition to navigating for you, your guide provides snacks, drinks, admission tickets whenever necessary, and a wealth of stories often unheard by visitors. Upgrade to include lunch and/or dinner at a classic Sicilian restaurant. Experience life in the Sicilian Countryside on a private tour of a working farm founded in the 1800s. See picturesque vineyards, olive and citrus groves, and farm animals and then learn to ride a horse with a professional instructor. Finish the tour with a traditional Sicilian lunch of locally produced cheeses, salami, prosciutto, traditional Sicilian relish Caponata, Parmigiana, olives, vegetables, domestic olive oil and home-made bread, with red and white wines from Etna vineyards. This private tour is a new way of experiencing Sicily, a jorney that combines emotions, experiences and lifestyle, surrounded by the discreet luxury. By private sailing boat with an expert crew and the exclusive on boat services you will enjoy the sea with refined elegance, sailing across the blu waters around Sicily. This trip will be full of great details and unforgettable experience. Let your imagination run wild as you sail through a sea full of history and myth. The boat is equipped with 1 DBL master bedroom and 2 DBL rooms at the stern, living room, chart and map room, dinning area, TV, stereo, air conditioning and big table. The kitchen offers 4 burners, electric oven, microwave, refrigerator, icebox, double sink.Not included: The transfer from your hotel to the Riposto and back. We will organize it additionally.Food & drinks on the boat instead of breakfasts, lunch in the 1st day and the dinner in the 2nd day. You can send the list of products and we will buy it for you. Terra di Mare, typical Sicilian house is situated in the midst of lush local vegetation with cacti, palms, agaves and oleander, on Mascali near to Catania.It's a lovely place for anyone who loves bathing and generally likes.Guests can choose among many seaside, free and equipped beaches: Fondachello, S. Anna, San Marco, Stazzo, Giardini Naxos and Taormina.For those who want to be more than just enjoying the sea, the surrounding area has plenty to offer. For example, Acireale, the baroque, its Churches, Taormina and Castelmola, Catania and other cultural events and for trekkers and bikers. Day 1CataniaDay 2CataniaDay 3Taormina.Day 4SyracuseDay 5Noto and MarzamemiDay 6RagusaDay 7Departure for the airport. During this tour, perfect for who loves Sicilian food, you will enjoy our tradition with a local guide who will explain for you all the Sicilian secrets while tasting many typical local specialities. Admire the incredible beauty of unspoilt nature of Sicilian countryside and visit a family run old milestone farmhouse producing wine, dairy, meat, fruits and vegetables. This tour is private – only for your party, nobody else, to ensure the highest quality for our guests, and includes pick-up and drop-off by private comfortable air-conditioned car at your port or accommodation in Catania. Upon arrival at the farmhouse, see picturesque vineyards, oranges, lemons and olive plantations, as well as many animals – sheep, cows, goats, deer, peacocks, wild boar, chickens, geese, and horses. Enjoy a delicious and hearty traditional outdoor lunch at the farmhouse. Taste locally produced organic fresh food – cheeses, salami, prosciutto, bruschettas, traditional Sicilian relish caponata and parmigiana, olives, mushrooms, vegetables, domestic olive oil and home-made bread with Etna red and white wines.